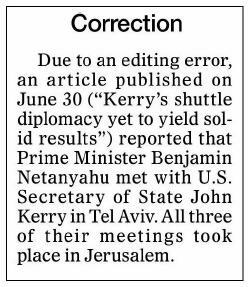 CAMERA’s Israel office prompts a correction today in Ha’aretz’s English print edition of an article yesterday which erroneously reported that Prime Minister Benjamin Netanyahu and Secretary of State John Kerry met last week in Tel Aviv. In fact, all of their three meetings last week took place in Jerusalem. Canceling a scheduled trip to Abu Dhabi, Kerry flew from Jerusalem to Amman for another meeting with Abbas, followed by a third meeting, in Jerusalem, with Netanyahu. In addition to publishing the page-two correction (below) today, yesterday editors fixed the online article. CAMERA commends Ha’aretz for its timely, clear correction. Click here to see additional corrections at Ha’aretz obtained by CAMERA and Presspectiva, our Hebrew site.